Whether you have a commercial or residential property in Fort Collins, Loveland, Windsor, Johnstown, Greeley, Longmont, Berthoud, or somewhere in-between, Cesar’s Concrete is worth your consideration for concrete installation projects. Patios, driveways, walkways, barn floors, and other project types are all within our range of expertise. The purpose of this piece is to enlighten our prospective and current customers regarding our concrete installation process. We want people to understand what sets us apart from other local concrete contractors beyond us making that general claim. Not to give too much away, but our prepping process with gravel and rebar is simply superior to other local concrete companies. Keep reading to find out why, in addition to learning a bit more about who we are at Cesar’s Concrete. Before we do any of that, however, below you’ll find a brief description of each of our concrete services. 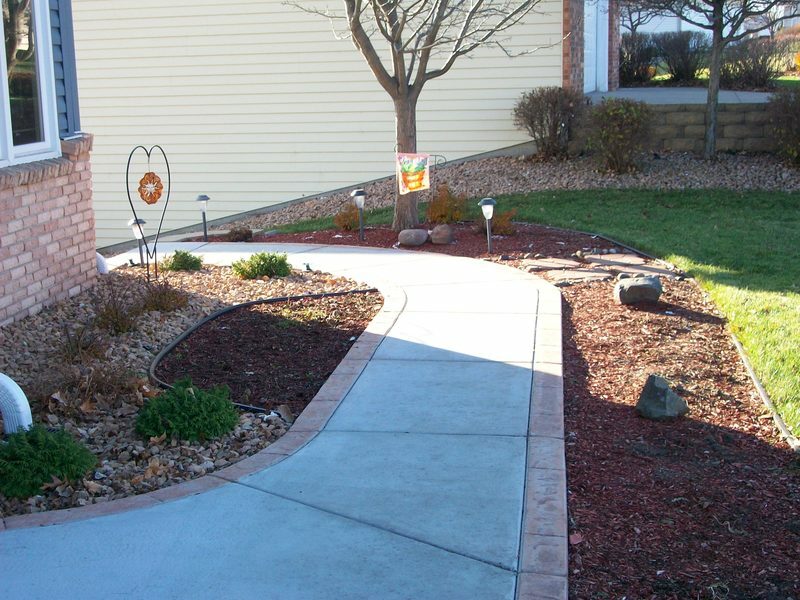 All along the Northern Colorado Front Range, we provide unique and affordable concrete driveways. Whether you are looking for a commercial or a residential concrete driveway installation, we’ll take the time to listen to and work with our customers to formulate a plan they are excited about. We specialize in bringing your unique vision to life by combining our industry expertise with your preference. 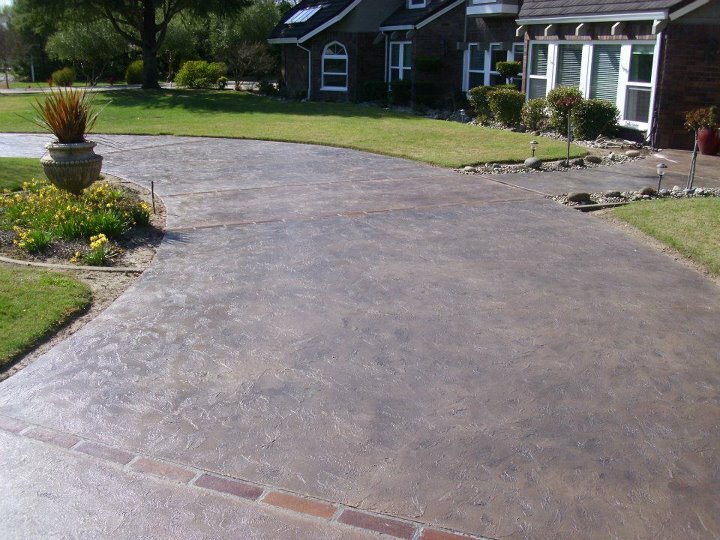 Stamped concrete, colored concrete, and other custom options are available! So if you aren’t the most experienced when it comes to concrete options and styles, don’t worry! This is our passion at Cesar’s Concrete. While we are talking about it, we might as well familiarize you with stamped and colored concrete. Stamped concrete refers to a concrete paving technique which imitates other popular paving materials like slate, brick, or cobblestone. 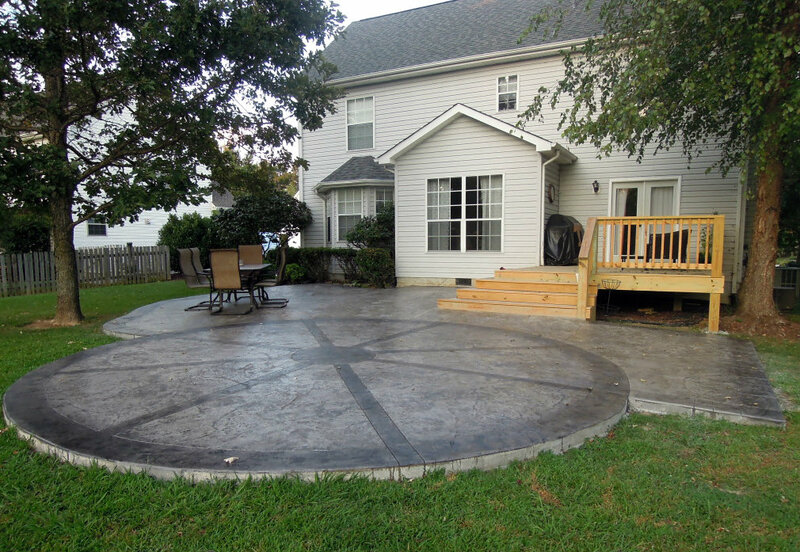 One of stamped concrete’s chief advantages is that it offers an improved durability when compared with other options. We are the stamped concrete contractor of choice for many customers who have become clients, so don’t hesitate to ask us about our colored and stamped concrete options while we are getting an action plan together. Though we are based in Johnstown, we perform concrete repairs and installations throughout our previously mentioned service area. For over twenty years we’ve been providing high-quality concrete walkway installations and repairs, helping our customers turn their house or place of business into a place they can be proud to show off. Whether you need help designing, replacing, or repairing a concrete sidewalk, we’ve got you covered at Cesar’s Concrete. Another service we provide is custom patio installation. We are a concrete company full of experts who understand that a patio not only needs to look great and be functional, but it needs to be constructed with your home’s structure in mind to add the maximum value to your property’s overall value. Plus, not having a patio to enjoy these beautiful Colorado sunsets on is pretty close to a sin, as far we are concerned! Aside from the primary concrete services we’ve listed above, we are able to perform commercial curb and gutter concrete work, commercial sidewalk installation, barn floor concrete projects, as well as commercial concrete driveway repair and installation. And don’t worry, if you haven’t seen the kind of concrete project you have in mind listed here, just give us a call and there’s a great chance we’ll be able to provide you with the service you need at an affordable price. It’s difficult to describe what our concrete installation process looks like because each project we perform is unique with its goal and vision. Sure, some concrete jobs we get contracted for are straightforward, so some generalizations can be made. We simply want to make the point that a custom concrete barn floor installation is going to be a heck of a lot different than a commercial stamped concrete walkway, or a custom colored concrete patio design, for that matter. Concrete installation, whether it’s commercial or residential in nature, begins with concrete pouring. For any DIY enthusiasts out there, knowing how to pour concrete can certainly help you save a few bucks by doing light concrete repairs here and there around your house, but for bigger jobs, we recommend leaving the pouring to the professionals. And yes, we’ll readily admit we have a horse in this race, but it’s like your grandpa used to say, “buy it nice, or buy it twice.” We are big believers in blending quality with value here at Cesar’s Concrete. Practically speaking, the pouring portion of the project includes basic steps like clearing the area of material or objects that might get in the way. This might be grass, old concrete, trees, rocks, or anything getting in the way. Next you’ll want to lay your sub base, which is simply the material on which you’ll pour the concrete. Most of the time, we’ll use road base or granular fill. The next step is to construct a form, typically a temporary wooden perimeter that we’ll secure. Forms are usually rectangular and need to be constructed well to ensure a high-quality finish on your project. After that, we’ll add rebar or another material to support the concrete we are about to pour. Finally, we’ll get to the pouring itself. In our concrete mixer we’ll add sand, gravel, water, and cement and pour it into the mold. We’ll begin at the portion of the mold that is the most “uphill,” and smooth over the wet concrete with what is known as a screeding tool. Next, we’ll float the surface to make sure the gravel-free concrete, or cream, rise to the top. The installation process also involves creating traction using a broom, making control joints with a groover, curing the concrete, and potentially applying color or stamping your concrete to give a truly unique appearance. Whichever way you slice it, those are some of the fundamentals regarding concrete installation in Fort Collins, or elsewhere. But keep in mind that each project is unique, and an assortment of external factors can impact how your concrete contractor goes about their work. For instance, did you know that living in a location that experiences extreme temperatures means you’ll likely need to employ special curing practices to get ideal results? Here at Cesar’s Concrete, we don’t simply want you to be pleased with the outcome of your concrete project right after it’s complete — we want you to be thrilled with the results for a lifetime. Again, we recommend utilizing professional concrete contractors for any serious installation or concrete repair work you might have, but maintenance can be left up to the homeowner if you are up for it. Given the fact that one of the chief benefits of using concrete in the first place is that it requires very little in terms of upkeep, all you really need to do is make sure that you keep it relatively clean while applying some sealer as needed. A good rule of thumb is that you should reseal your concrete every two years. In between the reseals, if you will, make sure to remove any stains as quickly as you can, while refraining from using deicing chemicals on your newly installed concrete. It’s not rocket science here! Given the previously mentioned diversity of projects that we’ve performed over the years, it’s likely helpful for our readers to be able to visualize the kind of work we produce here at our local concrete company. Check out Northern Colorado’s Top Rated Local® concrete projects here. You’ll find concrete walkways, sidewalks, natural stamped concrete, classy colored concrete, all with various tones and textures. Talking about the quality of work we perform is one thing, but seeing it is something else altogether, in our opinion! We think you’ll like what you see. Now that you’ve gotten a feel for what we can do for you with regards to concrete installation in both the commercial and residential sectors, allow us a brief word or two describing our history and identity as a Northern Colorado concrete company. Cesar Mendoza is our owner and founder, having established Cesar’s Concrete nearly a quarter of a century ago. Cesar built the company from the ground up with his own two hands, sometimes literally. From our concrete company’s beginnings until the present day, Cesar Mendoza’s mission has been to instill his work ethic and dedication to quality in every single concrete project we’ve had. Growing up in Mexico and being the youngest of five children means that Cesar’s commitment to integrity, quality, and responsibility started at a young age. Those values of responsibility, quality, and integrity are present in everything we do. As any kind of business experiences growth, one of the first casualties is typically company culture. At Cesar’s Concrete, this is not the case. We hire carefully, not only because we want our customers to be thrilled with the quality of work and quality of people who are on their property for a few days, but because we know that we will be spending a good chunk of most days with our coworkers. Things just go better for everyone involved when we hire folks with character, experience, and ability. Cesar’s Concrete was founded after Mr. Mendoza noticed the need for a new kind of concrete contractor. As you might be able to guess from the sentiments above, it was a contractor who acted with strong moral principles while still having the experience to back the affordable quote and friendly customer service up. As a testament to our dedication to doing things the right way, Cesar himself makes sure he comes out to every project we work on, whether it’s a big commercial concrete installation or a simple concrete repair. As is evidenced by Kathryn’s glowing five-star review, customers like working with us because we treat people how we’d like to be treated. We’ve said it before and we’ll say it again — we are a part of our Northern Colorado community, and we work hard to keep our reputation sterling up and down the Front Range. Whether you are interested in concrete installation in Fort Collins, Loveland, Greeley, Johnstown, Windsor, Longmont, or elsewhere, we’d love the chance to get to know you a little bit better. We are experienced, professional, and affordable at Cesar’s Concrete, so be sure to reach out to us even if you have a general question about our concrete services. Give us the chance to show why so many first-time customers become long-term clients at Cesar’s Concrete!